NBI Clearance application process now becomes easier and faster with the newly implemented NBI Online Registration System. This new eClearance NBI registration process only requires a fill-out of the online clearance registration with applicant information, contact details, family background and ither related infos needed. Its really now much quicker to get your NBI clearance with these step by step guide on how to apply, stated requirements, and speedier review process. This NBI clearance Online Application promises to simplify the processes and move towards eliminating queues. 1. The first in the procedure is to register in the official NBI Clearance Online Application website. The NBI website is simple, and direct. 2. Simply fill-up the NBI Clearance application form online. Just type in your correct personal information. Remember, whatever you’ve written in the NBI Clearance Online Application form is what will be reflected in your NBI Clearance. 3. When you have finished filling-up all the required field on the online form, click the SUBMIT button. This will load the second part of the NBI Application form. 4. Again, fill-up this NBI online form correctly and accurately. Click the SUBMIT button to submit your NBI Clearance Application Online. 5. A confirmation pop up window will appear, this your Online application is successful. 6. TAKE NOTE of the Registration Code. This will be your reference. 7. In the pop up window, click the “PRINT Application” button to see the final copy of your NBI Clearance application form. 8. Remember to print your NBI Clearance application then bring it when you go to the NBI Clearance branch. Sign it and present it during your NBI Clearance application. In case, you do not have a printer, simply copy the Registration code and present it in the NBI Clearance Office. They can look it up for you in their NBI Clearance Online Application database. 9. You can now begin processing your NBI Clearance in the NBI Clearance Office nearest you. a. Bring Two (2) Valid Identification Cards. b. Make sure to follow the appropriate dress code allowed in the NBI Clearance Outlets so that they will let you in without any problem. c. Bring the printed NBI Clearance Application Reference code, the one you filled out in the NBI Clearance Website. Make sure that the QR code is included in your printout. OR, if you don’t have a print out of the NBI Clearance Online Application form, just make sure that you copied the Registration Code and present it there. d. When you arrive in the gate of NBI Main, or any of its satellite offices, don’t waste your time. Ask an NBI Personnel currently stationed to assist the NBI Clearance Applicants right away. Ask them that you are an NBI Clearance ONLINE applicant. He or she will give you some directions where to proceed so listen carefully. Have your picture taken then the Biometrics will be the next step. The last step would be the issuance of your NBI Clearance. This is where you go to the printing facilities of NBI Clearance and receive your fresh-from-the-printer NBI Clearance!Congratulations! You have now finished successfully the application process of your NBI Clearance! 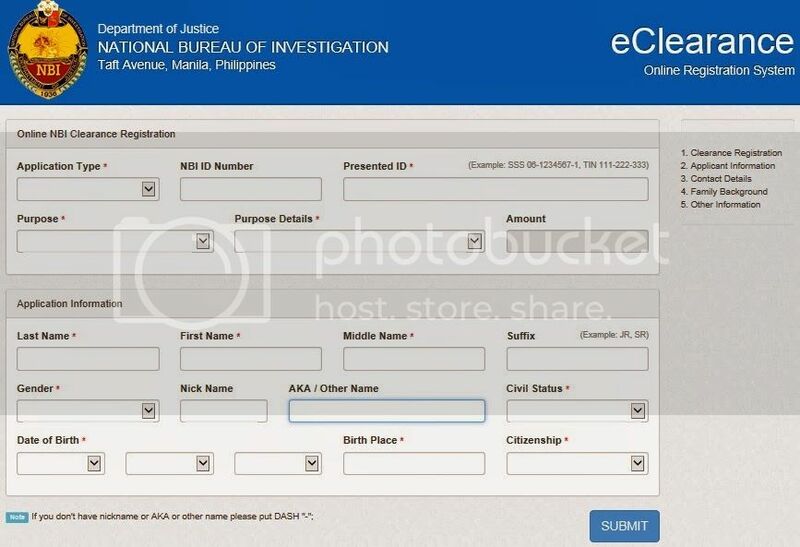 One Response for "NBI Clearance How To Apply using Online Application System Form – eClearance NBI Registration"